A special National Investigation Agency court in Kochi on Monday sentenced two convicts in the Panayikulam Students Islamic Movement of India camp case to 14 years rigorous imprisonment and three others to 12 years after they were found guilty under various IPC sections and Unlawful Activities (Prevention) Act. Additional District and Sessions Court Judge K M Balachandran said the accused are not entitled to get the benefit of concurrent running of case. 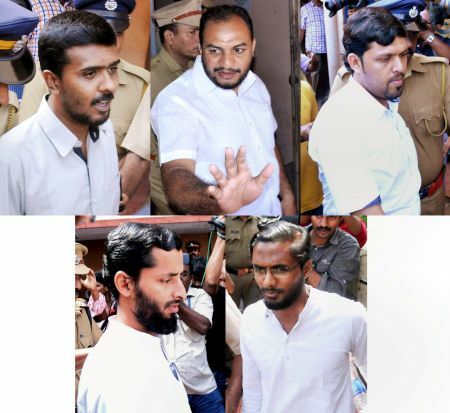 The court had on November 25 convicted five SIMI activists and acquitted 11 others in the case relating to a ‘secret’ meeting of the banned outfit at Pannayikulam near Aluva in 2006. The court found all accused guilty under Section 13(1)(b) of Unlawful Activities (Prevention) Act and awarded a maximum sentence of seven years rigorous imprisonment besides sentencing them under various sections of UAPA and IPC. Even though counsel for the accused canvassed for extending the benefit of Probation of Offenders Act to the accused, “since the offences committed by them are against our nation, I find that this is not a fit case wherein the benefit of the Probation of Offenders Act could be extended to them,” the judge said. The court imposed a Rs 60,000 fine each on first accused P A Shaduly and second accused Abdul Rasik while a Rs 55,000 fine each was imposed on third accused Ansar Nadvi, fourth accused Nizamudeen and fifth accused Shammi. “The sentences shall run consecutively with the result, the accused 1 and 2 will have to undergo substantive sentence of 14 years each and the accused 3,4 and 5 will have to undergo a substantive sentence of 12 years each,” it ruled. The period of remand undergone by the accused would be given set off as mandated under CrPc section 428, it said. The second accused Abdul Rasik and third accused Ansar Nadvi were found guilty of sedition, while first accused P A Shaduly, fourth accused Nizamuddin and fifth accused Shammin were convicted under Section 120 (b) (criminal conspiracy). Hailing the verdict, NIA prosecutor P G Manu said the court has awarded maximum sentences to the convicted who have been found guilty of anti-national activities. The prosecution case was a sub-inspector of Binnanipuram in the district had received information that the accused had assembled unlawfully at a hall in Pannayikulam and made inflammatory speeches. Books and pamphlets which were pro-Pakistan and anti-government, seditious and provocative in content with a view to create religious animosity were seized from them, it was stated. The accused hailing from districts like Idukki and Kottayam, Thrissur and Palakkad assembled at Pannyikulam only for the ‘secret’ meeting, the prosecution stated. The case was first probed by the state police and later handed over to National Investigation Agency, which filed a chargesheet in December 2011. The charges were framed by the court in June 2014 and trial commenced on July 2014. The prosecution completed arguments on March 2015.